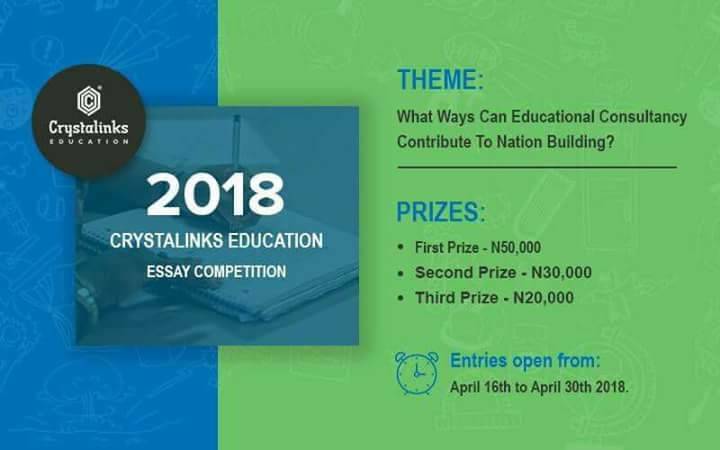 The second edition of the Crystalinks Education Essay Competition 2018 will open for entries on 16th April 2018. THEME: WHAT WAYS CAN EDUCATIONAL CONSULTANCY CONTRIBUTE TO NATION BUILDING? Participants in this contest are required to carry out research and also go through the services and core values of Crystalinks Education through the website www.crystalinkseducation.com and proffer implementable methods that can successfully pitch educational consultancy firms like Crystalinks Education in African countries especially Nigeria. 1. Participants must be students and individuals in Africa aged between 15-25 years. 2. Submissions should be made by email only to submissions@crystalinkseducation.com. 3. Only one entry per participant is allowed. 4. Submissions should include a cover letter with name, date of birth, email address and/or phone number of the participant. 5. Essays must be between 800-1000 words. 6. All submissions must be in English language. 7. Winners will be determined by judges selected by Crystalinks Education. 8. Participants will be rated or judged for out-of-the-box Content, Organization, Expression, and Mechanical Accuracy. 9. Submission of entries will be open from April 16th to April 30th 2018. A longlist of ten (10) will be published on May 15th 2018. A shortlist of five (5) will be published on May 22nd 2018. Winners will be published on June 1st 2018. 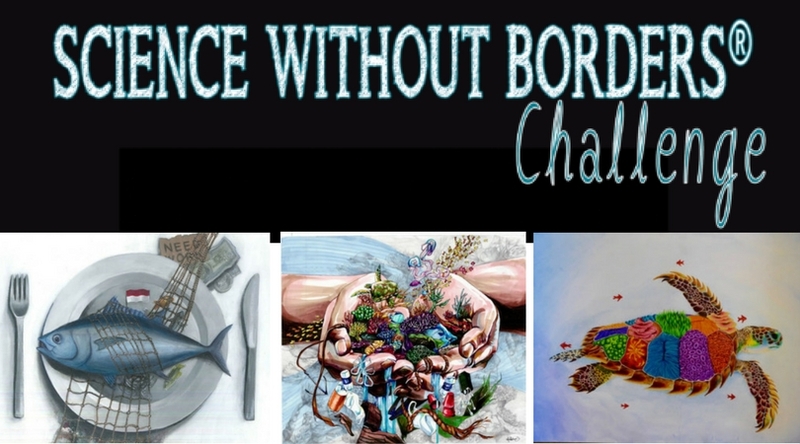 Science without Borders Challenge is an international art competition that engages students to promote the need to preserve, protect, and restore the world’s oceans and aquatic resources. Science without Borders Challenge was created to get students and teachers more involved and interested in ocean conservation through various forms of art. This yearly contest inspires students to be creative while using different types of media to promote public awareness of important ocean conservation issues. This year’s theme is “Why Coral Reefs Matter“. Use your artistic talents to create a piece of art that illustrates why coral reefs matter to you, your country, the world, and/or other organisms or ecosystems. 2018 has been declared the International Year of the Reef (IYOR). IYOR is a global effort to increase awareness and understanding of the values and threats to coral reefs, and to support related conservation, research, and management efforts. All around the world, nations, organizations, schools, and individuals will celebrate the IYOR 2018 in a variety of ways. There is no minimum or maximum size requirements for the artwork. Acceptable media includes paint, pencil, marker, crayon, ink, and chalk. All submissions must be made by an individual artist. Group submissions are not permitted. Open worldwide to all students 11-19 year-olds. For more information visit Khaled bin Sultan Living Oceans Foundation. The National Information Technology Whizkids Competition is open to students in Private and Public Secondary Schools in Nigeria. 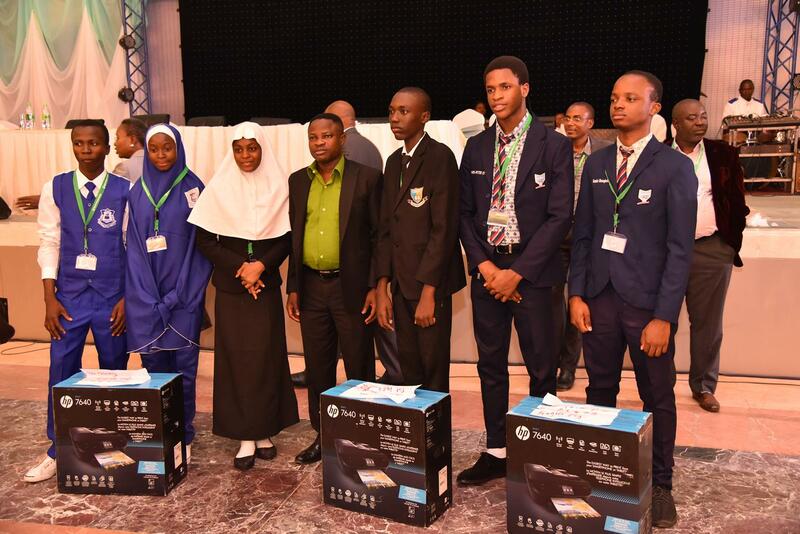 The Nigeria Computer Society considers the Competition as a development process and encouragement of excellence amongst secondary school students across the country, who are the future leaders of this great nation. Interested Secondary Schools should complete the registration form online for two (2) candidates with evidence of payment of N2, 000.00 (Two thousand naira only per school) registration fee. Only students from SS1 to SS2 are eligible to participate. TechGen Challenge is an annual convergence of kids, Tech companies, incubators, investors and other key tech players. It is an event organized by TechGen Africa. TechGen Africa has deliberately and strategically decided to prepare Africans for the future by addressing the problem from the foundations. This is done by teaching primary and secondary school kids computer programming, Arificial Intelligence, machine learning, Robotics and Animation. If you’re a school owner, Head of School, Principal, Proprietor, this is a competition you will want to part of, as this puts your school in the spot light. It is designed to foster healthy competition in ICT among kids & Teens, in various private and public, primary & secondary schools, in Africa. It is designed to initiate in African kids & teens, interest towards technological innovations. It is designed to stimulate African kids & Teens in the need to be part of the world’s tech ecosystem. Ultimately, it is to establish Africa as the leading tech producing continent in the world. Awards shall be presented to the best innovations as well as the participants. Follow Tech Gen Africa on its social media platforms. Follow Tech Gen Africa to get more information on the Tech Gen Challenge on Facebook, Twitter or Visit its website.